VHF/UHF/SHF Contest May 2016 – Record breaking! And another Contest is over. Again I learned a lot and I am happy with the results: With a count of 82 QSOs I broke my personal record in claimed QSOs in a 23 cm contest. Since October1990 the number has been as high as 78 QSOs. The claimed score is a little more than 30.000 points and a new personal record as well. 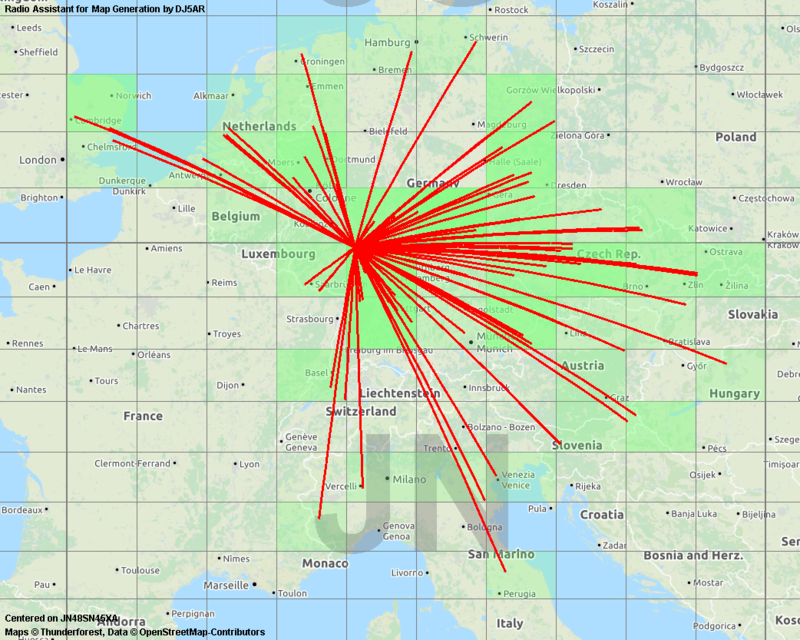 The 82 Stations, worked on 1296 MHz, are from 12 DXCC countries and located in 41 different grid squares. Countries worked were 40 x DL, 1 x F, 3 x G, 2 x HB9, 1 x HA, 5 x I, 6 x OE, 14 x OK, 1 x OM, 1 x ON, 5 x PA and 3 x S5. In most of the QSOs aircraft scatter was an important factor. 35 contacts were done in CW. ODX, as usual, was HG7F over 817 km, still my ODX via AS. Nice was to work 3 OE5-stations around local midnight within 10 minutes: OE5VRL/5, OE5JFL and OE5RBO. This entry was posted in Contest and tagged 1296 MHz, 23 cm, Aircraft scatter, Alpe Adria Contest, Microwaves on 2016-05-08 by admin. Last night we returned from Italy, where we spent some days after the Alpe Adria Meeting. It was nice to receive the award for the 2nd place in the Alpe Adria Contest 2013 on 23 cm, to meet the Hams there and to have interesting talks with them. Dino, IV3FDO was very hospitable and took some time to show us certain interesting places. So we learned, that the most delicious prosciutto of the world is produced in San Daniele and not in Parma. This entry was posted in Contest and tagged 1296 MHz, 23 cm, Alpe Adria Contest on 2013-10-27 by admin. This entry was posted in Contest and tagged 1296 MHz, 23 cm, Alpe Adria Contest on 2013-10-18 by admin. ….. 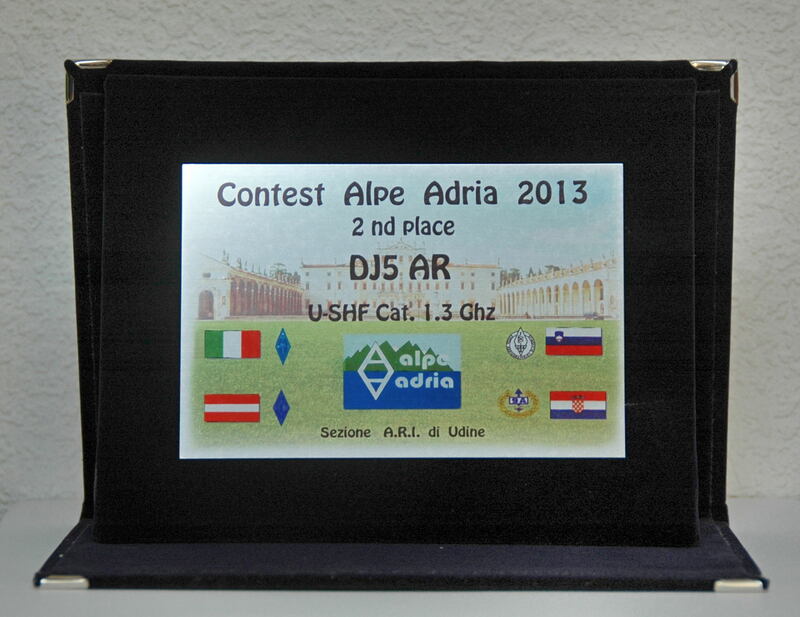 I worked in the Alpe Adria Contest last Sunday on 23 cm. In parallel there was an activity contest in Czechia. So a lot of stations from east, southeast and south filled the log. Remarkable was a nice SSB-QSO with Mirek, OK2UYZ in JN99FS over more than 700 km via tropo. Lane, S54AA in JN76EG could be worked, who was beaming into a large valley towards the Alps with mountains of 2.500 m. Another aircraft scatter QSO I had with Walter, IW3SPI in JN66OD, who is very, very close to the Alps. The reflections were rare and short but enough to complete. This entry was posted in Aircraft Scatter, Contest and tagged 1296 MHz, 23 cm, Aircraft scatter, AirScout, Alpe Adria Contest, Contest, DJ5AR, Tropo on 2013-06-17 by admin.